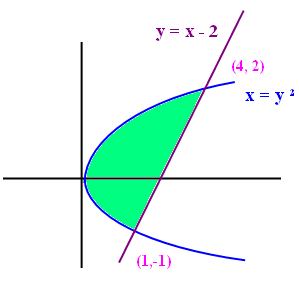 In this page area between two curves we are going to see example problems to understand how to find area between curves. First we need to draw the rough sketch for the given curves. For that let us find point of intersection of two curves. The first curve must be parabola and it is open right ward. Because we have square only for the variable y and it is positive. In order to remove square root we need to take square on both sides. If we take the region about x-axis we need to split the region as two parts. For avoiding that let us take the region about y-axis. So we need to take the limits as y = -1 and y = 2. We need to subtract the area below the parabola from the area below to the line. So that we will get the area of the shaded portion. Because we are taking the area about y-axis.